I wrote MEDICAL MANSLAUGHTER because my husband died due to DOCTOR ERROR in 2013! As I began to write the story, I learned that Medical Error is the 3rd leading cause of death…after Cancer and Heart problems! It has roughly been estimated that between 250,000 to 440,000 Patients die each year, due to Doctor Error. As hard as it was to write this book…keeping in mind I had to re-live it in order to write it…I had to fulfill a promise I made to my husband and myself, upon his death. People needed to hear what transpired, in order to save their own lives. 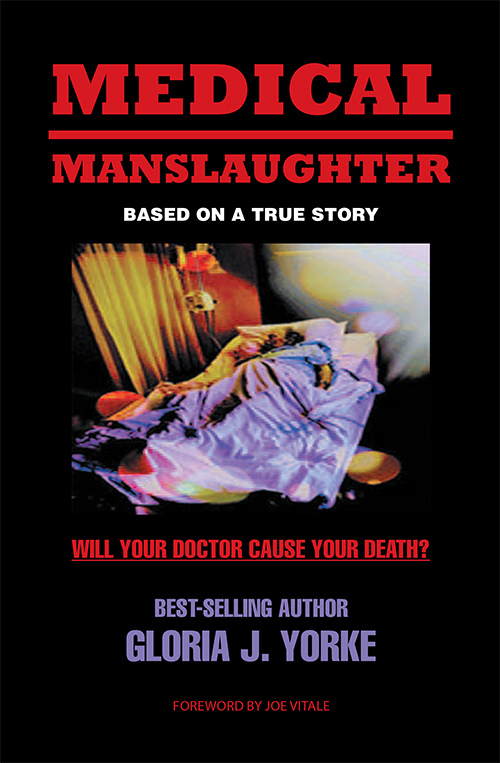 What happened in MEDICAL MANSLAUGHTER should never happen to anyone again! There is a dire need for an “outside agency,” under our Government rule, to review statistics, annual deaths, heart attacks, patient’s healing record history, and most importantly doctor’s individual patient fatality record. There has to be system in place, whereupon this pertinent information is assessed on a regular basis without Hospital knowledge or interference. Doctors have to be responsible for the decisions they make, regarding the well being of their patients, and how those decisions will affect their patients, for the rest of their lives!